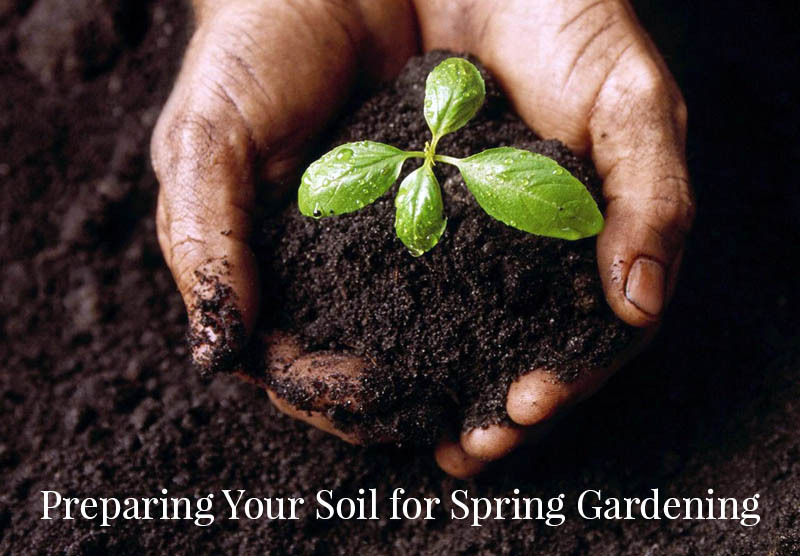 Preparing Your Garden for Spring: Make Sure Your Soil is Right! This is NOT Another 'Your Spring Gardening Checklist'! How many times had you read this: "Gardening Checklist For Spring"? I've been gardening for over 35 years, so I'd have to say I've read that line A LOT. And, what do you need to do right now? Just Google and you will get a list of about 20 things from ordering seeds to checking out your tools. Good information, for sure. However, this year I'm going to 'dig a bit deeper'! The #1 best thing you can do right now is begin thinking about your soil. Think of it this way: if you were going to bake a really delicious cake, the most important thing you can do is to bake with quality ingredients. That is the way to think about your soil. If you want grow a really great garden, the most important thing you can do is to make sure that your plants are going into quality soil. It is important for you to get to know your soil. Not all soil is the same! The good news is that if you have less than perfect soil, there is so much you can do to make it better! My own dilemma? Well, my farm is called Sandy Fields Farm, so you can see that my issue may not be clay, but with sandy soil I need to make sure that I have enough nutrients to support my plants. Sand is GREAT for drainage, but with that drainage goes the issue of the nutrients draining out of the soil. We have customers who are faced with clay soil, others with 'hardpan' soil that resulted from a developer bringing in subpar soil that will barely support a lawn. Others have drainage issues where their soil becomes a soupy mess after a rain. There are REMEDIES to all of these issues, but make sure that you understand what you have, and you figure out how to improve the soil BEFORE you plant! Even the best of gardens can be helped with the addition of organic amendments. If you have had good luck with your garden in the past growing seasons, and have had no significant issues with your plants, chances are your soil is healthy. However, we recommend adding organic compost in the early spring. If you have had significant issues, and you feel that there may be something wrong with your soil, it is a good idea to have your soil tested. Do it now (as long as the ground isn't frozen) so that the results will be back in time for you to remedy the issue. Your local extension agency is a good source. Amending the soil with high quality organic matter will give your plants a great start. Compost feeds the soil, releasing nutrients slowly in a readily available form. Compost will improve the drainage by adding porous organic matter, and also improves water retention. The best source is your own compost, but if you don't have any then a good quality bagged compost is a fine alternative. We advise against using grass clippings as they are often compromised with added pesticides. Tried and True Test: grab a handful of soil from your garden, and squeeze it together to form a ball. Apply a bit of pressure to the ball, and see what happens: if the ball breaks apart into loose pieces, it's time to get digging. If pressure causes the ball to break into large chunks or just flatten, there is still too much moisture. If the ball doesn't break or if breaks into a few solid clumps, your soil is still too wet. If your soil is still wet from heavy snowfall or spring rains, working it early means that you are actually compacting the soil, making it harder for plant roots to establish. You want some air space between the soil particles, and clumpy heavy soil can work to trap pockets of air round roots, damaging them. Please remember that not many plants can deal with compacted soil, so this should be your first step ~ loosening compacted soil by digging or tilling and make sure the first 6 - 8" is 'worked'. This is important for water penetration, allowing roots to grow deeper and spread wider and it brings oxygen to plant roots. Spring is literally around the corner. We are gearing up for our shipping season, and know that in less that 6 weeks, our customers in Zones 11 and 10, perhaps even 9, will be getting their FARM FRESH HERB PLANTS! For those of you in less warm areas, perhaps you have another 2 months or more, but as I said, it is time to consider your soil! Yes, all of those other tasks are important and we don't want you to ignore them, but what is all of that effort worth if you have considered the ESSENTIAL ingredient in your growing: SOIL!